Was the Batman and Superman match-up seen over the years in World’s Finest comics the first example of this kind of pairing? Probably not, but it offered the most enduring series in that realm. Actually, they first connected in the 76th edition of Superman from 1952. Their World’s Finest stint started with the magazine’s 71st issue in 1954 and continued on and off for decades after that. How could it not succeed? After all, it connected arguably the two most famous and popular superheroes ever. However, that’s not always a great thing. Look at all the sports teams that mix stars and go nowhere, and the music landscape is littered with “supergroups” that fell flat. Together, Batman and Superman offered some fun, but they remained stronger on their own. The two managed more positive chemistry and interaction than others might, but they still work best solo. An animated feature-length program, The Batman/Superman Movie demonstrated the pros and cons of the concept via a good but erratic show. Movie featured a pair of pairings. Joker (voiced by Mark Hamill) needs cash, so he steals a statue made of Kryptonite and tells Lex Luthor (Clancy Brown) he’ll kill Superman (Timothy Daly). Conveniently, Bruce Wayne (Kevin Conroy) visits Metropolis to seal a business deal between himself and Luthor. There he meets and falls for reporter Lois Lane (Dana Delany), to the disapproval of Clark Kent. Essentially, Movie showed these plot elements as they evolved. Inevitably Wayne discovers Joker’s local doings, so he slips into Bat-garb to chase after him. Supes also becomes suspicious, and the two heroes have iffy initial encounters. Neither trusts the other, and they’re not afraid to show that. The romantic entanglements don’t aid their burgeoning partnership. Movie worked best during its first half. In its initial half an hour, the program coasted on its concept. How can you beat the combination of Batman and Superman, especially since it’s abetted with the linking of archvillains Lex Luthor and the Joker? The sheer joy of these combinations made the flick fun almost in spite of itself. The film represented the first-ever meeting between Batman and Superman, and their developing relationship provided the most enjoyable parts of Movie. The two definitely didn’t hit if off, as their conflicting philosophies caused friction. I liked those moments; they showed a lot of life and spark. Bruce Wayne’s romance of Lois Lane always was very entertaining, and the combination of supervillains showed some potential as well. Unfortunately, that last aspect fell flat for the most part. Luthor has little to do, so Joker absorbs the brunt of the tale. He’s always an interesting character, but the lack of balance between the two harmed the film. Luthor felt awfully secondary most of the time; he didn’t play an active role, and that left the film without the appropriate dimensionality. Once the novelty of the pairings started to wear off, Movie began to become less interesting. Frankly, the show’s second half really became somewhat tedious. It had a few good moments of action, but the tale lacked a great deal of excitement and suffered from the absence of creativity. The first half coasted on the sheer concept, but once that faded, the program became less involving. Overall, The Batman/Superman Movie had its moments, but it seemed mediocre as a whole. The idea behind the show appeared sound, and mostly the execution worked acceptably well, but it petered out after a while. That occurred mainly due to a lackluster story that left one of its main characters with too little to do. Movie remained entertaining much of the time, but it wasn’t one of the better projects in its genre. 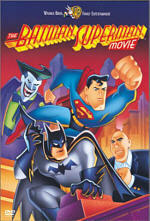 The Batman/Superman Movie appears in an aspect ratio of 1.33:1 on this single-sided, single-layered DVD; due to those dimensions, the image has not been enhanced for 16X9 televisions. 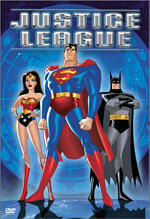 The WB animated superhero DVDs have been a mixed big. Some - like Batman Beyond: Return of the Joker looked quite good, while programs such as Batman and Mr. Freeze: SubZero seemed much less satisfying. Unfortunately, Movie fell into the second category due to a mix of problems. Sharpness looked erratic. The image showed moderate softness much of the time, as the program often displayed a mildly gauzy appearance. The picture displayed acceptable crispness much of the time, but the vaguely filmy quality made the movie seem “off” during a lot of the program. Some jagged edges and moiré effects appeared as well, and print flaws became awfully prevalent at times. I saw various examples of speckles, grit, grain, dust, nicks and hairs throughout the film, and these occasionally seemed pretty heavy. Colors usually looked fairly good. The various hues came across as nicely vibrant and lively, and they lacked any signs of noise, bleeding or other issues. Black levels seemed acceptably deep and dense, while shadow detail was fairly solid for the most part. Some scenes appeared a little too muddy, but the program usually showed those situations with good clarity. At times, Movie showed a pretty positive image, but the combination of print flaws and frequent softness left it with a “C-“ grade. The Dolby Surround 2.0 soundtrack of The Batman/Superman Movie seemed much stronger than the picture. However, that doesn’t say much, and overall, the mix sounded fairly lackluster. The film featured a decent but unspectacular soundfield. The forward channels demonstrated good stereo presence for the music and also offered a reasonable sense of atmosphere. Elements blended together well and panned nicely. The surrounds contributed general reinforcement of the front speakers but didn’t add much unique audio; they supported the overall impression without much more. Audio quality appeared positive but somewhat bland. Dialogue sounded natural and distinct without any signs of edginess or problems related to intelligibility. However, I heard a little vocal bleeding to the side speakers at times. Music seemed clear and acceptably rich; low-end response was acceptable but a little flat at times. Similar issues affected the effects. They appeared clean and distinct, but they lacked much punch. The overall impression I received from the track was that it came across as adequate but not anything special. Movie includes only a few minor extras. Cast and Crew just lists a mix of participants; we find no information about their careers. Better is a Conversation With Producer Bruce Timm. This five minute and five second piece offers some decent general information about the program and the characters, but it lacks much depth. 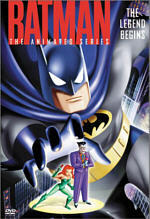 The Art of Batman provides a three-minute “music montage” of material. We see snippets from the movie intercut with various examples of storyboards, character designs and other conceptual art, all of which appears on top of some aggressive techno-influenced guitar music. Some of the information seems interesting, but the presentation stinks; the drawings fly by too quickly, and the hyperactive music video style display gets irritating quickly. Get the Picture also suffers from weak implementation. We find two segments that purport to teach us how to draw both Batman and Superman. These last 100 seconds and 60 seconds, respectively. Both show sped-up video of an artist as he draws the characters. Unlike a similar feature on Larryboy, we don’t receive any actual instruction about how to draw the heroes; we just watch the rapid pencil strokes. It’s brief and fairly useless. Similar comments relate to the The Joker’s Challenge. This pointless game has you select different items to aid in your “quest”, which you can play as either Batman or Superman. Correct choices show the appropriate scene from the film. At the end, nothing happens; there’s no reward other than bits of the movie itself. It’s a waste of time. Lastly, we find some trailers. There’s a clip for Movie as well as ads for Return of the Joker, Batman and Mr. 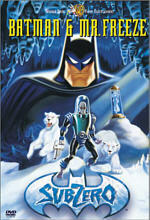 Freeze: SubZero, a series of Scooby-Doo DVDs, and a preview of the summer 2002 live action Scooby Doo flick. While I expect the latter to stink, I must admit the trailer’s funny. Ultimately, I liked The Batman/Superman Movie, though it wasn’t one of the best flicks from its genre. The movie petered out after its first half, but it still managed to offer enough fun and excitement to work for fans of the series. Unforutnately, the DVD offered a lackluster piece. It suffered from fairly poor picture along with average sound and a blah package of extras. If you’re really in the mood for a superhero fix, Movie will do, but my recommendation can be lukewarm at best, largely due to the rather weak DVD.